The final instalment in Urban.com.au's Nightingale Village series is Austin Maynard Architects's (AMA) contribution at 8-10 Duckett Street. The seven-storey project represents AMA's second foray into the Nightingale model, having already designed Nightingale 3.0 at 209 Sydney Road. Andrew Maynard is also one of the founding members of the Nightingale Housing Board and one of the original investors in Nightingale Housing. 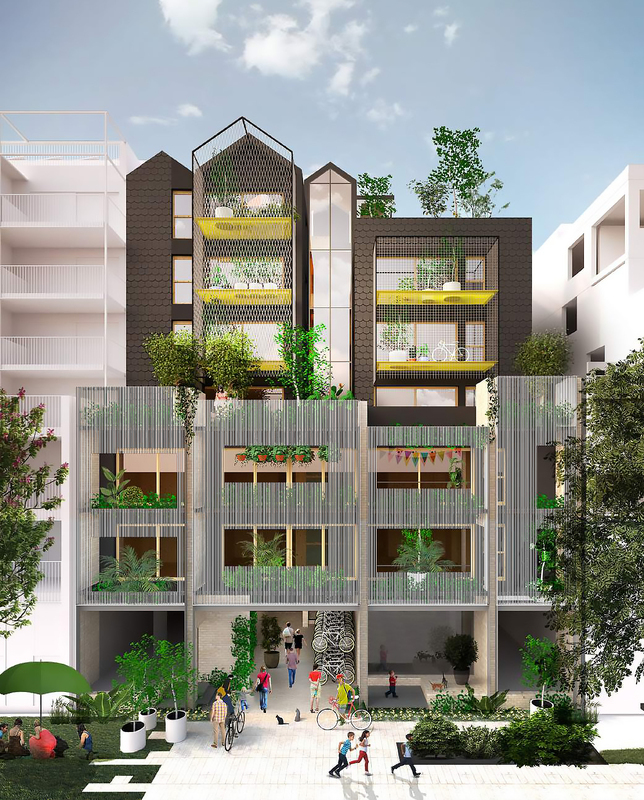 AMA's Nightingale was conceived as a seven storey-mass comprising a three-storey streetwall, with an upper level setback of 5 metres, responding to the adjacent massing of its neighbours to ensure a cohesive built from outcome along Duckett Street. Characterised be gabled roof forms which draw on the diverse character of the precinct, the upper levels have been designed to appear visually recessive and comprise a combination of dark patterned concrete and lightweight framework. This framework supports the balconies which project 2 metres and are enclosed in mesh to provide a sense of lightness and transparency. This is achieved through the application of full height chain-link or metal mesh with 100-120 mm apertures. Whilst the low quality warehouses on Duckett street have no heritage significance, we are keen to reuse the existing bricks to create an architecture that shares the DNA of Brunswick’s existing warehouse fabric. The design of the streetwall takes references from the small to medium scale industrial streetscape in the surrounding area. modern industrial materials, for example, webforge, are used to compose the new facades, in order to reduce the visual weight of the building mass from the street with economical considerations. The new streetwall is broken into four vertical volumes, mimicking the existing rhythm and fabric of the warehouse constructed in the surrounding area. The streetwall represents a departure from some of the other Nightingale Village buildings with the three-storey volume presenting a semi-transparent interface to the street, albeit with an element of privacy achieved through the adoption of a visually dense webforge mesh. Despite its density the mesh still allows light to permeate through, while conforming to planning regulations. Light wells have been inserted to respond adjacent buildings, The Dux and Clare Cousins Architects' 12 Duckett Street and further assist in reducing the visual bulk of the building. These also provide apartments with a secondary outlook, complementing the primary outlook directed to either the mews to the north or Duckett Street to the south. The ground floor accommodates apartments to the north and two retail tenancies to the south along Duckett Street, serviced by entry breezeways which also serve the dual function of not only providing resident access but also bicycle and resident storage in addition to a BBQ area. Two landscaped pocket gardens sit within the footprints of the light wells either side of the lift lobby. A native Brittle Gum on the northern boundary has been identified as being in excellent condition by the project Arborist, with the project team taking the necessary measures to ensure the retention of the tree through demolition, construction and occupation, with only minor pruning required to facilitate the development of the building. 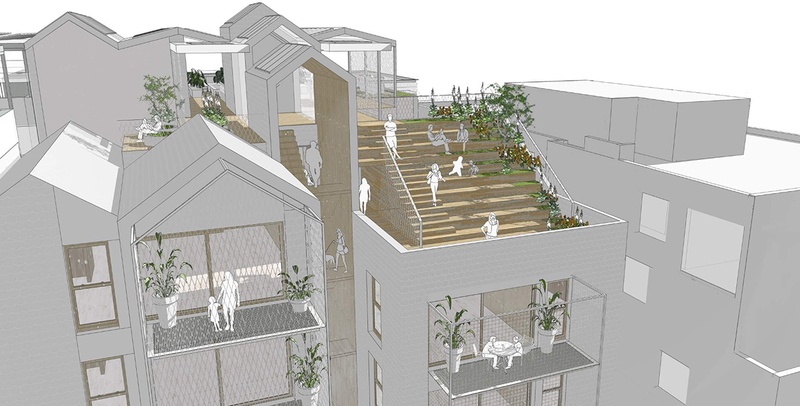 A series of decks which bridge the two volumes above the ground floor, adjacent to the lift, also provide a communal dwell space for residents. In keeping with the Nightingale model of activated roofscapes, AMA have located a series of bleachers for relaxation to the south in addition to a communal laundry and clothesline, communal dinning, BBQ facilities and veggie patch. Overall 8-10 Duckett Street will provide 27 apartments, two retail tenancies totalling 196 sqm and 80 bike stackers, and concludes Urban.com.au's look at Nightingale Village. We'll be sure to keep you updated on the progress of the Village as well as any future Nightingale projects.